at 10.30am & 5.40 pm. 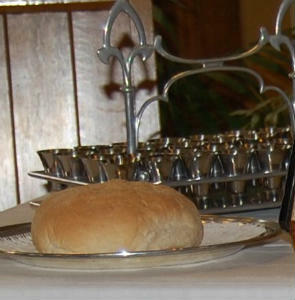 We celebrate the Lord’s Supper at the evening service on the first Sunday of the month and at the morning service on the third Sunday. Our ministry can best be described as conservative evangelical, open to renewal, with sermons based on the authority of Scripture. We use the New International Version of the Bible and copies of this version are provided in the pews. We use SongPro (Creation Software) for the projection of Bible readings (mainly NIV) and hymns, with Songs of Fellowship (1, 2, and 3), Mission Praise (1, 2, & Junior), and the Baptist hymn book giving a balance between newer songs and older hymns as appropriate. The morning service caters for people of all ages with the children and young people going to their Sunday Club classes about half way through the service.